There was really nothing about “Money Monster” that interests me and yet somehow I found myself watching it. It could be because I’m a sucker for George Clooney and I want Jodie Foster to do well as a director, but it’s certainly not because I’m a Julia Roberts disciple. Lately, her work has proven to me that I can do just fine without her. 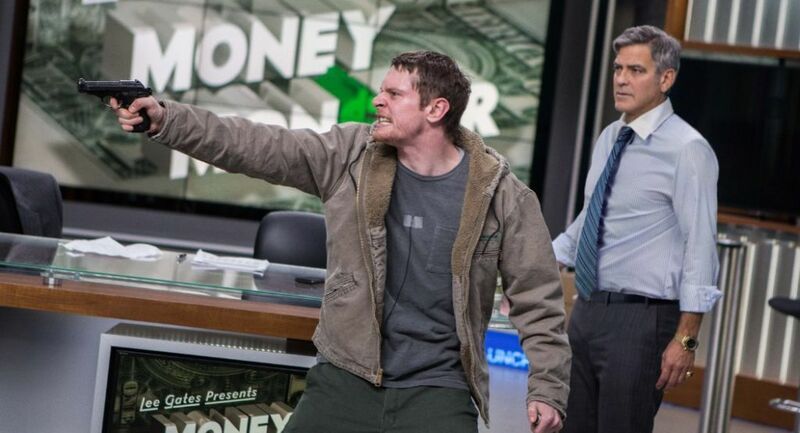 But the biggest thing this movie has going in against it as how disinterested I am in movies that feature Wall Street corruption or media that covers stocks and bonds as entertainment – “Money Matters” has both and it tries to turn it into a riveting thriller. It doesn’t do so well at being entertaining and it’s not very thrilling, but somehow it’s not awful either. Clooney plays Lee Gates, the insecure and superficial host of “Money Matters”, a stock tip financial show on basic cable (clearly riffing off Jim Cramer, of the controversial show “Mad Money” – not that I watch it; I’m just aware of it and know its reputation), which uses clever clips and flashy graphics as it covers stock news, tips and trading. His longtime producer, Patty Fenn (Julia Roberts) is about to quit her job for a better opportunity on another show and quite possibly because shes grown tired of Lee’s sophomoric antics. The program is about to cover late-breaking news that IBIS, a lucrative tech company has recently lost $800 million of their investor’s money, which CEO Walt Camby (Dominic West) holds “a computer glitch” is responsible. As the show is about to live, Camby is unavailable (in his own private jet somewhere), so his CCO Diane Lester (Caitriona Balfe) is scheduled to appear remotely to discuss how this crash occurred. The recording is suddenly disrupted however, when a gun-totting parcel deliverer named Kyle Budwell (Jack O’Connell) – a viewer of the show who is extremely distraught over a recent tip Lee had given audiences in regards to IBIS – holds the show hostage while demanding that cameras remain rolling. This resulted in Kyle losing a $60,000 inheritance and now he wants answers as he straps a bomb vest to Lee, brandishing a dead man’s trigger that has police swarmed around the New York City studio and everyone in production concerned. As panic and fear intensifies, revelations about Kyle, Lee and the IBIS business dealings are made, as Patty does her best to calm and direct her television host via earpiece while trying to find the truth that will solve the crisis situation. What’s funny about that last part is how easily Roberts’ Patty and her crew are able to acquire information while their host has a gun to his head. When just minutes earlier, Patty was assuring a stick-to-the-script Diane, “We don’t do gotcha journalism here,” Immediately followed by an under-her-breath quip, “Hell, we don’t do journalism period.” Yet there she is, tracking down all sorts of details from sources involved with Walt Camby – like an algorithm programmer in Seoul and a couple of hackers in Iceland – with the help of another producer/turned gopher Ron (Christopher Denham, whose character intro opens with him testing erectile cream for Lee, for some reason – and then using it), who winds up running all over Manhattan at the behest of Patty. As the movie started introducing characters, I found myself wondering why all these money shows are hosted by guys. Why does it have to be a middle-aged white guy? Or why couldn’t Julia Roberts play the host and George Clooney her producer? Would that be too hard to believe? It would definitely be more interesting, but maybe director Jodie Foster would have a hard time getting the movie greenlit without certain star power properly aligned. 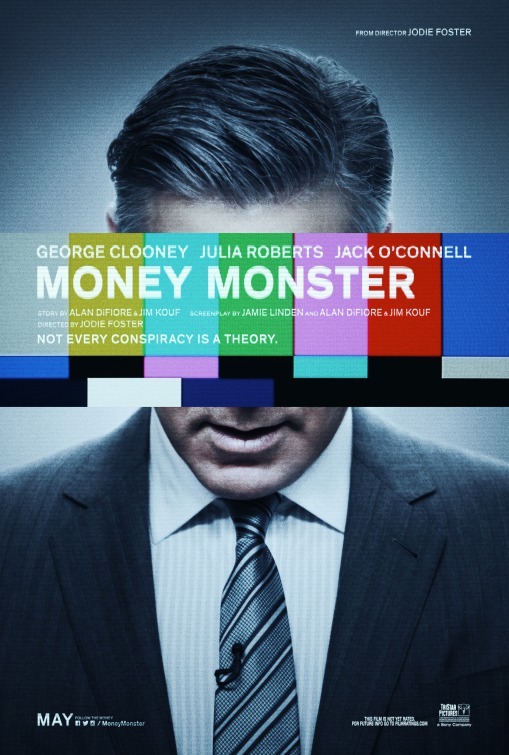 The problems that arise in “Money Monster” isn’t necessarily Foster’s fault, since the screenplay has a storyline that is preposterous and lazy as well as stock characterization that feels recycled from a story that could’ve been ‘ripped from the headlines’ about ten years ago. The movie is penned by three writers – Alan Di Fiore (who’s found success writing for Canadian television series) veteran screenwriter Jim Kouf (who wrote two great 80s flicks, “The Hidden” and “Stakeout”) and Jamie Linden (“Dear John” and “10 Years”, two Channing Tatum vehicles) – and it primarily suffers from taking two obvious subjects like Wall Street corruption and the manipulative influence of these flashy and snarky shows that make money-making out to be a form of entertainment. One of those subjects has been done to death in recent years (guess which one? ), while the other is in need of some multi-layered dissection. Sadly, you won’t get that here. Instead, there’s some silly lines of dialogue and ridiculous plot lines. 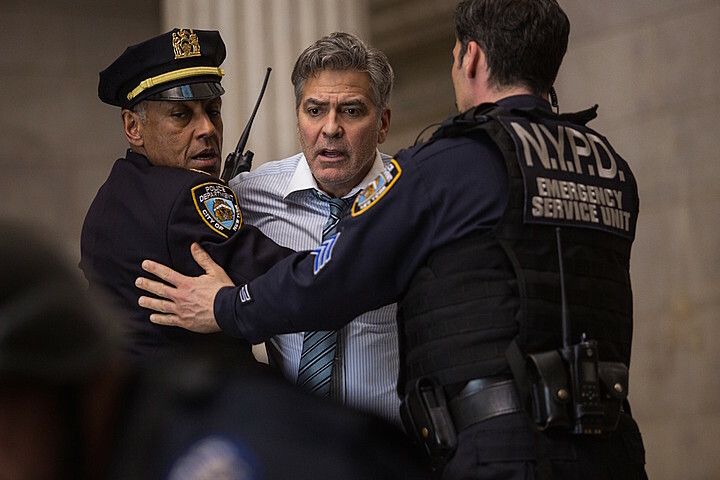 Granted, “Money Monster” (I’m sorry, but that’s just a stupid title) convincingly gets the on-set atmosphere and interaction down between those in front of and behind the camera – and Clooney and Roberts fit nicely into their roles – but it’s what these characters do that seems implausible. For example, during the hostage situation, the NYPD seem incredibly ho-hum and sort of inept about the whole situation. Characterization is needed for both the police captain (the usually great Giancarlo Esposito) and the negotiator (Chris Bauer “Tomorrowland”) involved, who feel extremely underwritten, like they walked off a Jerry Bruckheimer production from the 90s. None of them seem to have a clear plan for resolution and the captain even tolerates being hung up on by Patty. There are also elements about O’Connell’s Kyle (who forces an awful New York accent onto our ears) that just doesn’t add up. Granted, the security at the recording studio is about as secure as a McDonald’s, still, how is he able to just waltz in as a delivery guy carrying to large boxes without showing ID or checking in? All we get is an obese sedentary guard saying, “Oh, you’re the new guy, huh?” As we learn more about Kyle, we discover the poor guy isn’t the smartest knife in the drawer and we almost feel sorry for him, especially when his pregnant girlfriend Molly (Emily Meade) is patched in an effort that backfires when all she does is berate and belittle him on live television, which winds up being the movie’s best scene. In fact, that was probably the only unpredictable scene in the entire movie and in a proposed thriller, that’s not a good thing. 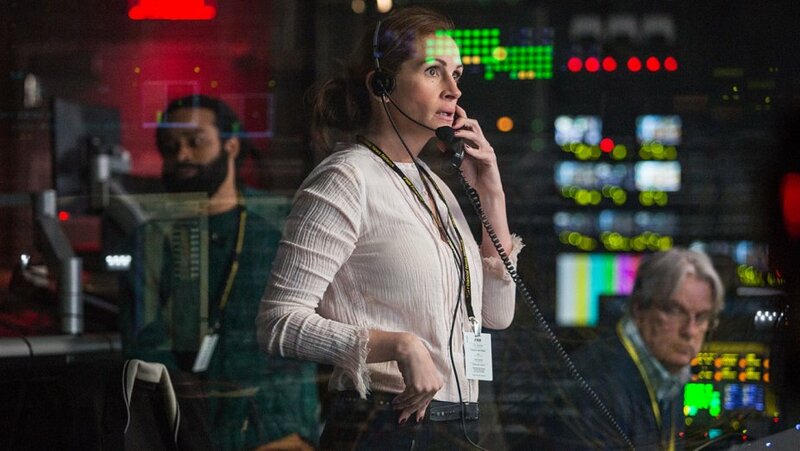 Ironically, the characters that are the most interesting in “Money Monster” are the women involved, which is no surprise considering the director. Jodie Foster has come a long way since “Little Man Tate” and has spent recent years helming episodes of “House of Cards” and “Orange is the New Black”, so it’s good to see her behind the camera of features again – hopefully, this could be something we’ll see more frequently from her. 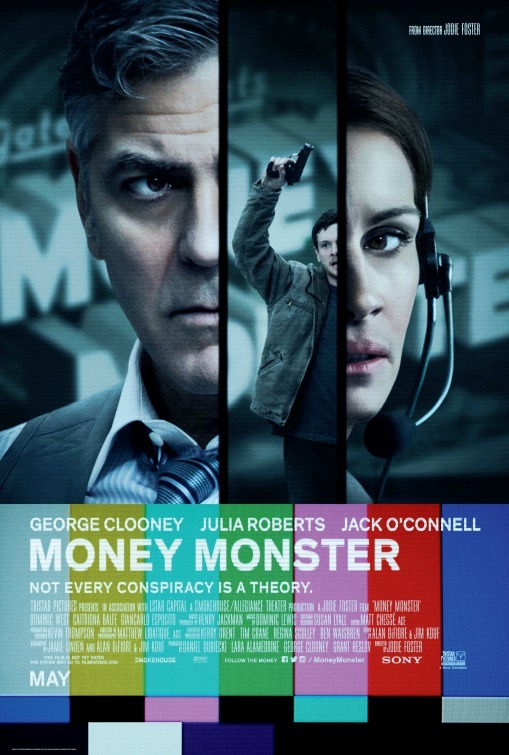 If only “Money Monster” had a better screenplay, one that would provide some nuance for Kyle, some actual twists (kind of needed for a thriller) and maybe more logic overall, Foster’s movie would be one to recommend and not just one that comes and goes like a sandwich from a restaurant you’re perfectly content with yet kind of bored of at the same time as well.